The 24-year-old Argentina fights past Hugo Dellien from Bolivia to lift his second trophy on the ATP Challenger Tour. 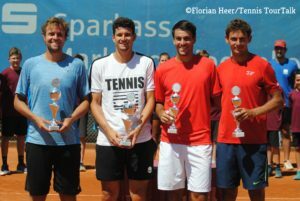 Juan-Ignacio Londero of Argentina is the champion of the ninth edition of the Marburg Open. The 24-year-old emerged victorious from Saturday’s all-South-American singles final with Hugo Dellien from Bolivia 3-6, 7-5, 6-4. Londero converted six of his 11 break point chances in a topsy-turvy encounter. The World No. 170 finished the encounter after two hours and 12 minutes. This triumph marks Londero’s second ATP Challenger career title. The Buenos Aires resident lifted the trophy in Mexico City earlier this season. “I have been on a good way so far. Very pleased with that.” Londero, whot takes away €6,190 in prize money as well as 80 ATP ranking points, will try to continue his good run of form at the ATP Challenger in Bastad next week. Dellien was seeking his fourth title of the season. “I haven’t played that well over the last couple of weeks. So I am happy to reach the final here,” he said. Earlier in the day, Fabricio Neis from Brazil and David Vega Hernandez of Spain clinched the doubles title. The top seeds rallied past the all-Swiss combination of Henri Laaksonen and Luca Margaroli 4-6, 6-4, 10-8. The encounter lasted one hour and 35 minutes. 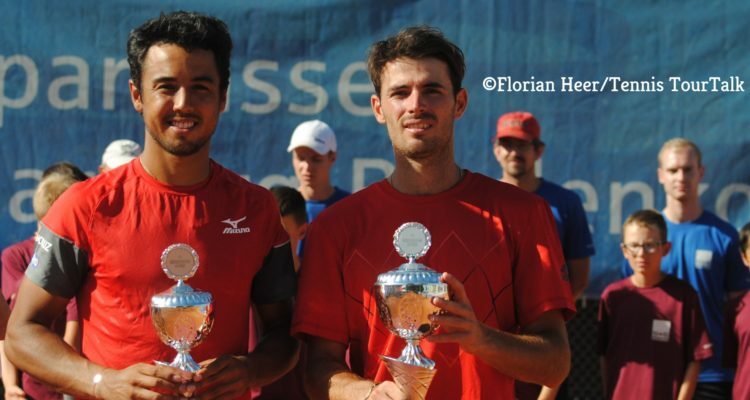 Neis and Vega Hernandez also lifted the trophy in Blois, France two weeks ago. And how does it go on for the successful tandem? “We will split up,” both were laughing, as they will play with different partners next week. Neis is heading for Braunschweig and Vega Hernandez will compete at Perugia. This entry was posted in ATP Challenger Marburg, ATP Challenger Tour and tagged ATP Challenger Tour, David Vega Hernandez, Fabricio Neis, Henri Laaksonen, Hugo Dellien, Juan Ignacio Londero, Luca Margaroli, Marburg Open.